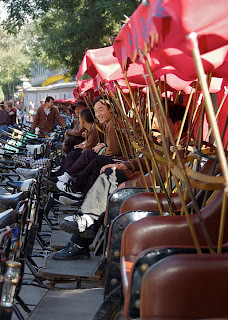 Yesterday, (actually 2 weeks ago) Tuesday in Beijing the weather was perfect, mid 60's to 70's and blue skies. 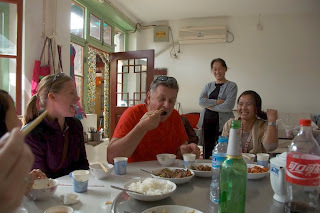 We took in the Hutong area on our first outing leaving in heavy traffic around 9:00 am. We had a rickshaw tour through the alleys of households that dated back to the Ming dynasty. This was a chance to see the ancient lifestyle that still exists today, despite the Olympic building program and an increase in high rise contruction..bikes everywhere, cars all over and lots of places in reconstruction..property goes for outrageous prices..in the millions for an apartment. Many share bathrooms and are lucky to have a place here.